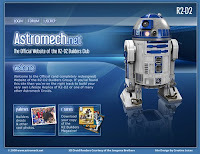 Today I'm trying a new feature I'm calling "Best of Astromech.net". The goal is to pick a few of the cool threads I noticed throughout the week. There are hundreds of other posts that I haven't featured, but these are a handful of cool ones. Let me know if this is helpful. Dome Topper Specs/ Reference Pics Forum user bolidelorean offers up information about the various dome toppers available. Also found here are some pictures of a screen-used droid's dome top. Digital Soldering Stations Lynelle brings up a great question about digital soldering stations - a big improvement over simple irons for anyone doing a lot of soldering in their droid. Buhatkj's Mostly plastic R5 Build Log buhatkj shows us how he built a foot drive system for his droid. R2 Has a New Brain Marc from California installs a leg control application for his droid. Best of all, he has multiple videos showing how it works! Again, let me know if you think this is helpful. If you have a favorite thread or topic, feel free to drop me a comment. EDIT: Comments are now enabled!